Travel Ticket save the date calendar card with a design which is ideal for a wedding taking place in another country. A save the date calendar to send to guests to let them know a date has been set for the wedding day. 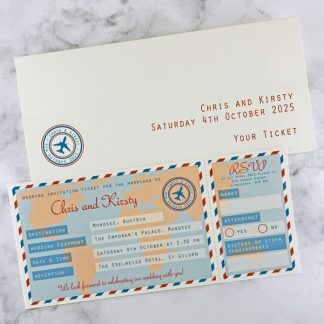 The design co-ordinates with the Travel Ticket range of wedding stationery, which includes ticket wedding invitations and co-ordinating stationery to use on the wedding day. Save the dates are sent to wedding guests as soon as you know the wedding date, to ensure they keep it free. This means invitations can be sent much nearer the wedding date and is especially useful for a wedding taking place in another country, where guests may need to plan ahead and save! These calendar design save the dates show the month the wedding is taking place, with the wedding date highlighted. The text can be customised and there is room to include a location if you wish. 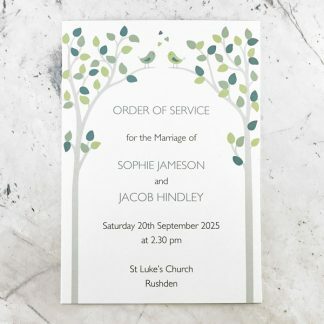 At the top of the card there is a circular logo, similar in style to a passport stamp, which features the names of the couple getting married and the date. The Travel Ticket design is based on two colours, which can be selected from the wedding stationery colour chart. Each save the date calendar card measures 10.5 x 14.8 cm (A6 size). 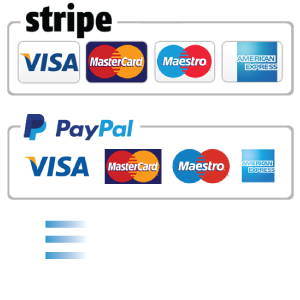 The design is printed on to high quality 300 gsm white or ivory card, with a smooth or textured finish. A co-ordinating white or ivory envelope is supplied with each calendar.